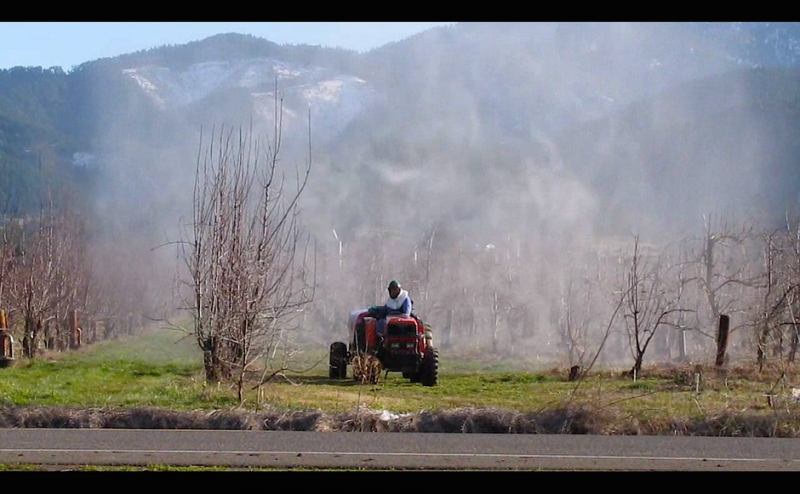 Cloud of pesticides surround pear orchard worker in the Rogue Valley. Farmworker advocates say this kind of spraying can cause pesticide drift. A federal court has reversed a decision to allow the use of a a pesticide that can cause brain damage in children. The 9th Circuit Court of Appeals found Thursday that the Environmental Protection Agency improperly stopped a scientific review of the pesticide, known as chlorpyrifos. In a 2-1 decision, the court also ordered the EPA to stop its use on all foods within 60 days. Former EPA chief Scott Pruitt halted the pesticide’s review last year to “provide regulatory certainty” for the widely used pesticide. That’s when Washington Attorney General Bob Ferguson signed onto the lawsuit, along with six other states, Washington, D.C., and environmental and farmworker groups. Chlorpyrifos an ingredient in pesticides that are often used on crops, like onions or grapes. It helps protect against a variety of “sucking pests,” like the Asian citrus psyllid that carries a devastating citrus disease. Its residue can be left on food, especially fruit. Children and pregnant women are at most risk for high exposure, which can lead to lower IQs and attention deficit disorders. With pesticides, “small amounts at critical windows of development in early life can have profound impacts throughout the course of a person’s life,” said Paul Tower, with the advocacy group Pesticide Action Network. Advocacy groups had been working to ban chlorpyrifos since 2007. Nearly a decade later, in 2016 the EPA was on the cusp of banning its use on food products. But after Donald Trump became president, his administration ended the review. The broad-spectrum pesticide had already been banned in homes. Farmworkers and their children face even bigger risks of exposure to chlorpyrifos, which can drift through the air when it’s applied to crops. It also stays in fields for up to 18 days. “Our agricultural fields should be a source of life, not sickness and we will continue pushing for a safe environment for our farm workers all over the nation,” said Hector Sanchez Barba, Labor Council for Latin American Advancement executive director, in a statement. In its decision, the court wrote that the EPA has not been able to determine that there is “reasonable certainty” that no harm would come from repeated exposure to chlorpyrifos.